jennie's nails and tales: the nail files: nail polish quiz! I've got a little something different for you this week. Something FUN and AWESOME and FUN! Wait, that was two funs, but because this is MEGA FUN, the two funs shall stand. Haha! If you're a fellow nail polish enthusiast, then you probably already play the game I Bet That I Know The Name Of That Random Lady's Polish in your head, but now you get to play it in real life! But Jennie! You're probably thinking, How is that possible? 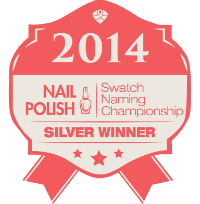 Well, my lovelies, Nail Polish Canada has done the awesomest thing ever and put together a nail polish quiz called the 2014 Swatch Naming Championship! I bet you're starting to understand the whole two funs now, eh? The quiz has 16 swatches and each one has two options for its name. Pick the name you think it is and, at the end, you'll get your score and a badge with your ranking! A badge just like this! Now, be advised that this quiz is serious biz guys. I mean, I consider myself to be quite the nail polish officiando and I only got 10 out of 16, which earned me a silver badge, and a ranking of 119. All of the rankings are saved, with the top 10 displayed, which means that you could be famous, guys. FAMOUS! Okay, maybe not that famous but still, your name will be on the Nail Polish Canada website, and that's pretty cool. So do it! DO IT RIGHT NOW! A two minute break is all you need to get a-quizzin'! You only have 10 seconds for each swatch, though, so make sure you can concentrate for the whole time. Your score depends on it! So how'd you do? Did you get enough points for a gold badge? Let me know so I can be jealous! Haha! And don't forget to link up afterwards! Happy weekend, everyone! Well I got gold with 13 correct, but it was complete happenstance. I guessed on nearly all of them!! Getting ready to go to bed, but I will do this quizz this weekend.